I hope everyone had a wonderful Christmas and the hangover is not getting you down this morning. Lets get to the week ahead. 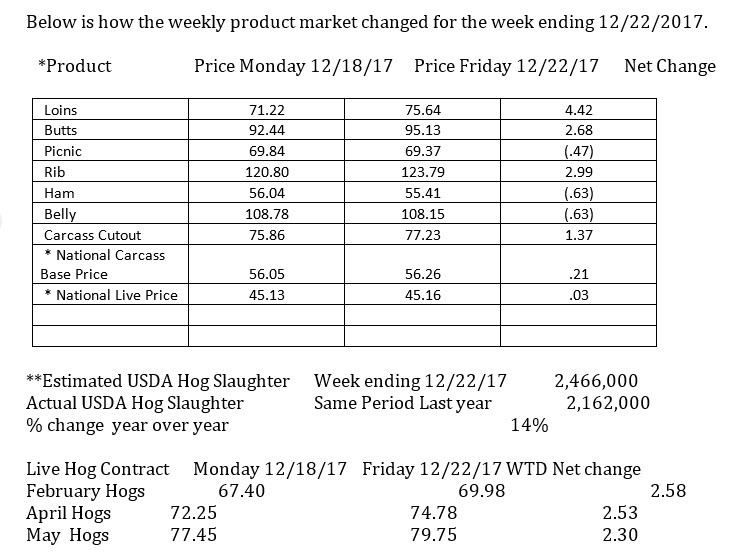 We enter the week long 1 unit of Feb hogs with around 67 cents with what we feel is a bullish report as a tailwind, when looking at cold storage. The processor cuts, hams and bellies, have in all probability bottomed out this week. While they may not go up much until after the first of the year, there isn’t much downside liability either. This is, in our opinion, backed up by Friday’s cold storage report. The report showed total pork at 504,975 lbs (expressed in 1,000 lbs), as of the end of November this year versus 518,813 lbs last year for a decrease of 3.7%. The largest contributor to the decrease is the year over year change in the hams- 106,101 lbs last year versus 98,170 lbs this year. This indicates that the demand for hams has been good through most of the fall. They have now gone down in price enough to start building a good demand base going into the first quarter of 2018. Some analysts are calling the belly number disappointing by showing a month over month increase from 32,268 lbs for month end in October to 36,002 lbs for month end in November. The reason they look at this negatively is the fact that there were a lot of analysts, ourselves included, for an out movement of bellies from the cold storage for the month of November. This wasn’t likely to happen, but with the demand we saw in October, it was a possibility. The fact still remains that going into next year, the industry will still not have enough bellies in cold storage to keep the summer prices under control. We could still see $2.00 bellies again in 2018. The producer does seem to have kept his marketings current as indicated by the weight category of the 180 over at 102% of a year ago versus the 103% of the survey of estimates. Couple that with the USDA marketing category coming in at 102.5% versus the 102% of theanalysts’ estimates. Last Friday 12/22, the USDA December Hog and Pig Report was released. It can be considered neutral to bullish for hog futures prices. Below on the left side of the page is a survey of analysts’ estimates, with the right side being Friday’s USDA actual report. The February and April hogs are still a buy on sharp breaks as indicated by the pig crop report. We recommend buying February hogs under $68, raising our previously suggested buy price of $67. Watch for the opportunity to buy April hogs under $72 if they get there. We will address the deferred futures trades in the next couple weeks. We need to see how the price changes develop so that we can have a chance to study the effect the pig crop report has on them. Right now, it is just too early to make a determination. The next couple of weeks may be slow with regards to export business. With pork prices at these reduced levels, we all need to be looking for news of export sales by monitoring agricultural and meat industry news websites.